Very comfortable. Shipped quickly. Easy to assemble. Treat yourself to regenerating and comfortable sleep with this memory foam mattress set. 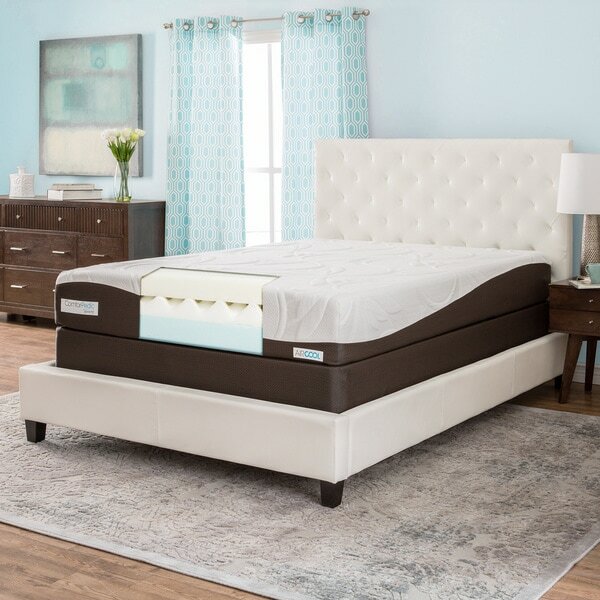 Featuring a combination of gel and memory foam layers, this mattress is designed to provide excellent pressure relief, freedom of movement and temperature regulation. Its innovative support system guarantees additional edge support to avoid roll-off and sagging. The mattress is also covered by a 10-year manufacturer's warranty. Better than bed in a box, this mattress comes rolled in a bag that won't split open during transport and is easy to carry into any room of your house. We are very very very pleased with this purchase. The reasons for the 4 stars is: first, the matress came 4 days before the box springs. We had box springs from my previous set, but they were pretty old so we decided to get new ones. We have a king size, so it is 2 twin box springs. We opened the mattress and put it on the old box springs. We cut off the plastic and within 2 hours it was full size. Super soft. We didn't realize how bad our old one was, till we laid on the new one. It wasn't quite as firm as I would have liked, but my boyfriend loves it. I will say if you are questioning if you really need new box springs, then get them! I could not believe the difference when we finally got the new ones delivered and put together. It was amazing! Which leads me to the second reason for the 4 stars. When we received them they were in long boxes, just the wood, to be put together ( we knew that we had to put them together and it was very easy). When we were putting them together, we noticed that 2 of the slats we cracked. We put them together anyway, thinking that it wouldn't matter. Well my BF woke in the middle of the night to a cracking sound, and one of the slats broke straight through. It was not a huge deal, we went to Home Depot, bought a 3 dollar piece of wood and fixed it. I never rooted it to Overstock because it was a quick fix. I really feel it was more of a delivery problem. We have had the bed for 2 full weeks now, and we can honestly say "we love it". No more back or hip pain when we wake up. Definitely would recommend this bed and buy the box springs! I love it within 2 days my back was no longer sore when I got up in the morning. I purchased the ComforPedic Beautyrest memory foam mattress set about 3 weeks ago and have been very pleasantly surprised at how comfortable it is. The "plush" softness is perfect to prevent body aches, but not too soft so that you feel like you are in a hammock. I like that the edges are firm. It feels comfortable to just sit on the edge of the bed. Most of the mattresses I was looking at did not have this feature. I'm very pleased with my purchase of this mattress. Assembled my new ComforPedic yesterday. Everything was included in the box for the frame. Went together easy. Only problem I had is that my hands aren't strong enough to pull the cover over the last edge on the frame. It's too snug for me to do it. No matter, no ones going to see it. Put my box springs on top of it and then put the mattress in the bag on top of that. I started to cut open the plastic bag and discovered you'd better be fast because it wants out! I laid it down on the box springs and wahla! I had a beautiful 10-inch mattress. It didn't seem to need any time to be fully extended, but maybe it's still growing, I don't know. What I do know if that it was heaven to sleep on 8 hours later. I fell asleep immediately (although it might have been because I put the whole thing together by myself - from dragging it into the house from the porch to lifting it out of the box and hefting the mattress up onto the box springs. That is after I disassembled my present bed and dragged that into another room). But none the less I slept like a baby. And when I got up at 5 am to go to the bathroom I fell right back to sleep until 9 am. I don't feel the aches and pains I usually do in the morning. And I should be lame after all that work. I'm 76 next week and have MS. Would I have liked help putting it together, yes. But I knew that wasn't going to happen. I guess if I can do it, anyone can. Rather shocking to receive the mattress in two pieces. One was a long skinny box which was the box spring, and needed to be assembled. Turns out it was very easy to do, and had it built in about an hour. The mattress arrived in a roll inside a large bag, which was scary because I thought that I made a mistake and ordered a blow up mattress. Once the plastic bag was opened, magic happened and bingo, I had a queen size mattress ready to go. The mattress is very comfortable and would recommend to anyone. It was very awkward to put this bed together by myself with it being so large. It would have been nice for better instructions on which way to turn it so that it would open right side up. It was a challenge to flip it over because it is so big when it opens up. That being said, it is so comfortable. I love this mattress. I do say that the instructions they send with the box mattress are horrible. They do not give you any directions for the king mattress. So it doesn't look anything like the pictures. For those who buy this in the future, keep in mind that for the king mattress you are putting two twin size box springs instead of one large piece. Hopefully in the future they will give instructions appropriate for the bed you purchase. I would still buy this bed again and recommend it to everyone. Perfect combination of plush and firm. I'm a plus size woman so I've had a difficult time with memory foam(the dreaded sink hole). This mattress is perfect. Ever have a bed so great that every time you sit on it you are amazed at how awesome it is? Welcome to that mattress. I truly love this mattress. There are days that I cannot wait to get home to simply lie in my bed. It is so comfortable. I chose one with some firmness to it just to be on the safe side. I love the way it contours to my body when I sleep. I also loved the price!! This is a spectacular comfortable mattress! I am a shopper and I shopped all of the stores looking for the best mattress for the best possible value. This mattress by far and above the rest certainly is not only gorgeous and comfortable but the value was incredible. Furthermore, don't forget the free shipping right to your door is unbelievable benefit. Other vendors/stores will charge well over $100 to deliver. If you are hesitating on making a decision....don't!! Haven't tried it yet letting it rest for 24 hours. But it looks and feels amazing. And NO smell like other competitors reviews I've seen. The foundation was simple to put together if you can Follow Pictures. Just a follow up I have guest in transition and she lives this bed! She said it is so comfortable! Extremely happy with this mattress. Well worth the price. I purchased when I was 8 months pregnant and wish I had purchased sooner. Highly recommend! "Do you have to use the box spring? Or can the mattress be used on a platform bed?" Yes, these mattresses are designed to be used both with a box spring and/or on a platform bed, provided there is adequate support while the mattress is in use. "Does this come with the box spring and bed frame or do i need to buy the bed frame separate?" This includes foundation and mattress. "regarding the comfort pedic mattress10"full size, what do I need underneath it? My bed frame has wooden slats." "Does the foundation take the place of box springs?" "Are these mattresses new and not refurbished? Can you explain how the box spring is shipped?" My matress was new.It came in a small box, compressed. Once I opened it, I followed instuctions to air it out, compress..there ya go. The boxspring came in pre-cut, pre-drilled hole peices. I folliwed instructions and lined up the holes, applied the screws. It was so easy to do. Hope this helos. .
"Why is the width of the mattress set only 60"?" Hello Reichmad, we do paologize for the confusion, this item is approximately 76 inches wide. Please feel free to contact us again with any further questions. Thank you for shopping with us! "I asked the question below and never received a response?? I purchased a mattress set from Sears because Overstock is not diligently listing the exact mattress for sale as there's 2 conflicting densities on this listing! The fact you can't return mattresses and are not providing accurate info is wrong on Overstocks part!" Hello Jmac83, we apologize that you never got a response. I will Customer Care contact you soon as possible. Have a great day!